There was a photo of a drawing doing the rounds earlier this week on Twitter showing a crossroads in Cambridge where there was a debate about how to fit cycling into a situation where the side roads weren't wide enough for cycle tracks. 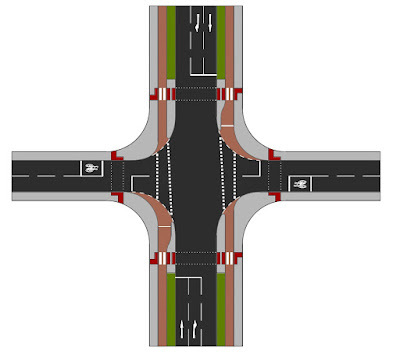 The official designs for the junction showed a cycle track with parallel crossings (where people walk and cycle next to each other, but in separate space) over the side roads. All well and good, but with people cycling to the right of people walking (in the direction of travel), left turns for cyclists would be banned which is pretty useless if you need to turn left. 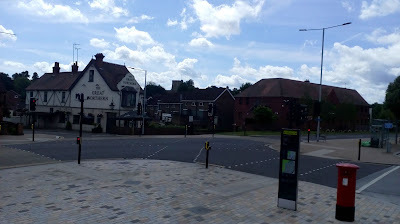 The photograph above shows what I mean - you can see the parallel crossing over the side road, but you can just see the banned left turn sign at the bottom of the traffic signals which are for cycle traffic (full-sized and low level). In this case, left turning cycle traffic actually turns off before the crossing and pops out in the service road in the distance and so is a kind of 'free' left turn. A closer view of the signals is below. So, how could we provide for left turns in this sort of situation but where there is no opportunity to turn people in advance and where there's no space to turn people behind the pedestrian crossing points because the side road isn't wide enough for cycle tracks? I don't think that doing nothing is the answer because apart from being a cop-out, people moving under their own power are just going to turn left anyway; not because they are reckless criminals, it's because it's an unreasonable requirement. If we are providing for cycling, then we need to do it properly by anticipating the likely (and desired) behaviour and accommodating it. 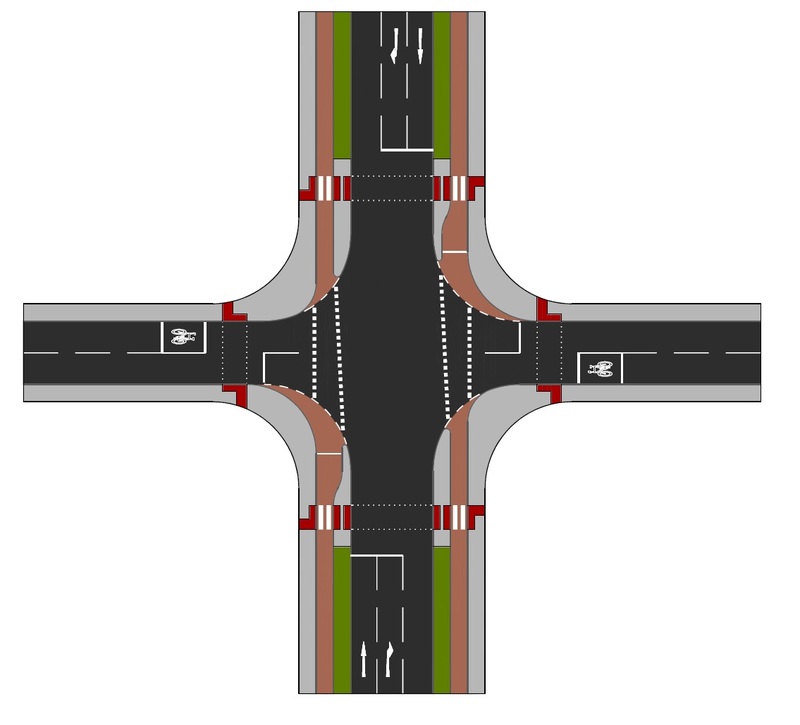 We could use toucan crossings such as the ones outside Hatfield Station in Hertfordshire because essentially, there is nothing technically illegal about turning left out of a toucan crossing; but, we are sticking cycling into walking space which is a fudge. 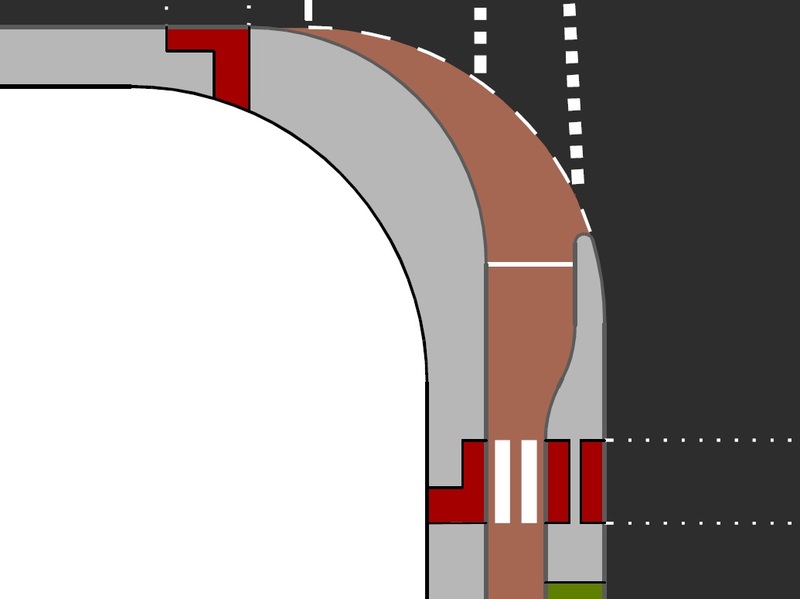 I think the answer might be what I will dub the "partially-protected left turn" (because I don't know if it has an official name); the protection being a combination of physical measures and clever user of traffic signals. Compare this idea with a fully protected left turn where a cycle track would continue into the side road to permit fully protected left turns. 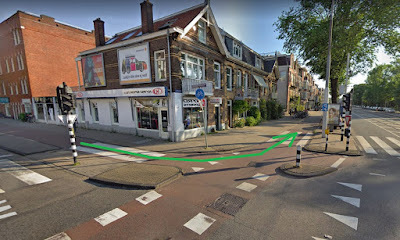 The photograph above shows a Dutch junction which I've mirrored to show an approximation of what a UK protected left turn would be - mainly because I don't think I have a decent UK example in my photo library! The green arrow simply shows that the left turn can be made without worrying about general traffic - it's also called a free left turn (from the UK point of view). So, here is my partially-protected left turn (above). The main road runs north-south in this example, with the side roads forming the crossroads east-west. As on the photograph above, we've one-way cycle tracks which cross the side roads on parallel crossings (which is key), but the difference from the parallel crossing photograph above is left turns for cycle traffic are catered for. In fact, right turns are also catered for because with this particular layout, the parallel crossings running together allow it; not forgetting that pedestrian crossings are also running at the same time on the north and south main road arms. Perhaps with the right turns, some further guidance markings might assist. This stop line would be accompanied by a low level cycle signal (LLCS) to be in the eye line of a turning cyclist. Once the parallel crossings and crossings of the main road end (all together, remember), the the LLCS on both side roads will go green and the turns into the side roads are complete. In fact, we can be even more clever. If the LLCS from the partially-protected turns run before the side road traffic is released (using what is called 'early start') then the turns are completed way before other traffic gets into the side roads from behind them. 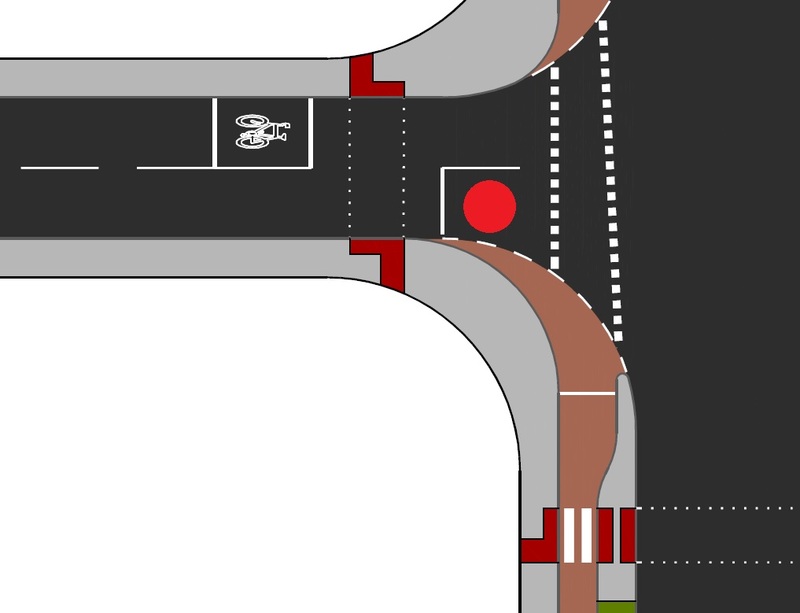 Early start would also allow people cycling out of the side roads to turn left from the advanced stop lines (ASLs). The other important feature is that in order to allow cyclists to turn right from the side roads, we really need to be releasing the side roads on their own stages otherwise cyclists potentially have to wait for a gap in oncoming traffic. It isn't vital we do this from a traffic signalling point of view, or even from a 'conventional' safety point of view, but it is a lower collision risk and would feel so much safer. Ideally, the side roads will be coming from low-traffic areas and so the green time needn't be too long which would allow them to run separately. The sequence above shows how some of the signal stages would work. I've not bothered with the north-south general traffic stage; so starting with the parallel crossings/ main road crossings, you can see left and right turning cycle traffic stopping in the side roads at the stop line. Right turning cyclists would give way to oncoming cyclists as they would if this was general traffic running together. Next, the green comes in for the road to the east. This allows the cyclists waiting in the entrance to the road on the east to proceed west and complete their turn from the previous stage. Cyclists coming from the eastern arm can turn left onto the cycle track to head south or to turn right to the far side to go on the other cycle track to head north. There is also a green on the LLCS for the entrance to the side road on the east because there may be cyclists from the previous stage who are completing their turn - I've highlighted this in yellow (but it's a green signal). The last stage is just a reversal with the western arm getting a green, but we don't have the LLCS for previously turned cyclists as we did in the previous stage because there wouldn't be anyone left waiting (yes, it's complicated). If the two side roads ran together, then the movements could be as I described, but the LLCS on both side roads would come on together, definitely with an early start to allow cyclists who turned on the previous stage to complete their movement. This would then essentially run as a 3-stage junction. With the stop lines in the side roads, there is a risk that some cyclists won't stop (don't write in) - we are dealing with people after all. However, is this any riskier than the toucan fudge or people ignoring a banned left turn on a parallel crossing? I appreciate that this is fiendishly complicated to understand - it was to write down and I'm hoping I've got it right myself. I'm sure someone is going to spot a flaw which means I end up either rewriting or trashing this post (joke - hopefully). Now, this isn't pie in the sky. There is a similar layout to this on the CS2 cycleway in East London. The junction of the Whitechapel High Street/ Commerical Road/ Leman Street has this layout. Well sort of, because Leman Street is one way going away from the junction. 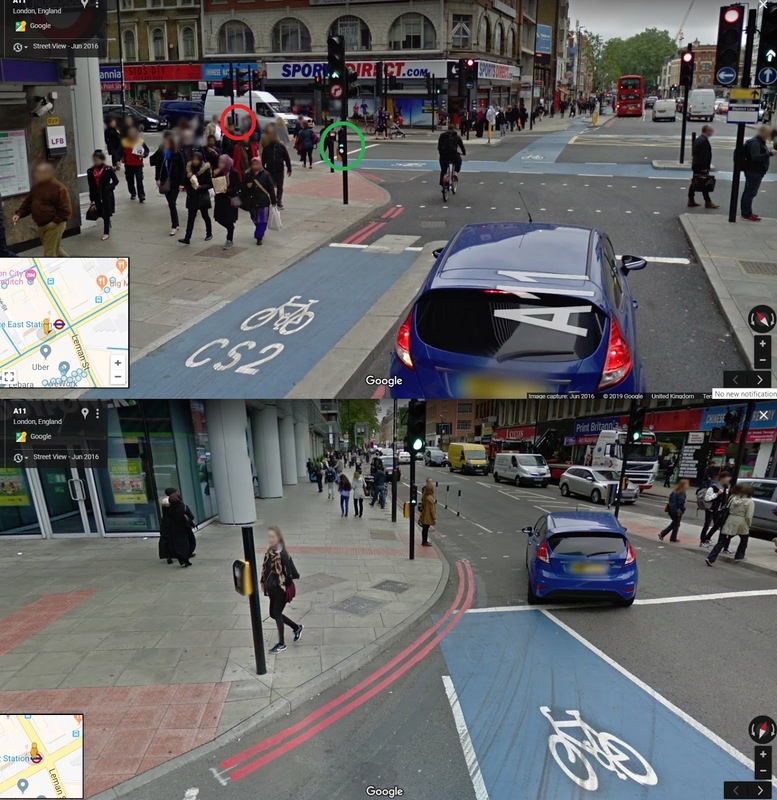 I think there are other similar junctions on CS2, but this one does show LLCS in the way I have described them, but to be fair, I should probably go for a better look and make a video! The junction is much larger than in my example because left turning drivers are held when cycle traffic and ahead moving general traffic runs together (called 'hold the left turn'). Where cyclists get a green, they are permitted to turn left or move ahead; the right turns for cycle traffic is banned because because of the way the staging is set up (I'll come back to that in a minute). The top image (above) shows the eastbound cycle track on Whitechapel High Street. As luck would have it, cycle traffic has a green on both full-sized signals and LLCS (circled green). In the side road (Commercial Street) you can just see a stop line and a red LLCS. Left turning cyclists would have to stop at the red as with my drawing above and the bottom panel shows a view once one is around the corner. Right turning cyclists here would actually move ahead to the far side of the junction and then wait on the nearside to complete the right turn as a two-stage right turn - I'm not suggesting this at all in my layout, although you could do it - although the first time I used one in the UK, it went a bit wrong! The LLCS green to clear previously turned cyclists is still a two stage right turn, but you turn right before the second stage without having traffic thundering past you. In my view, this is far superior because you will be looking at a LLCS right next to you rather than a signal on the other side of the junction. The cycle tracks approaching the junction are under some space constraints - whether this is actual width, a desire for a buffer (with planting) or some other issue. However, because of the more open geometry of the junction compared to the roads before the junction, we actually have a little more space to play with. The flare allows people to queue side by side at the stop line which increases throughput of cycle traffic. People turning right can also move to the right in readiness. 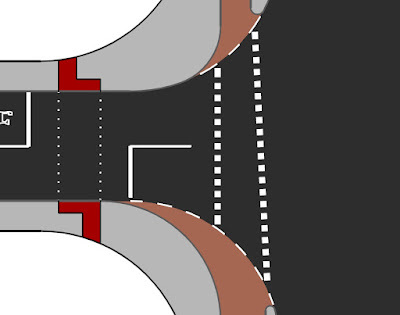 The left turn also flares a bit to help slower left turners to get out of the ahead/ right cycle traffic and the radius of the kerb here is designed to be comfortable for people using non-standard and adapted cycles. The other features in the close-up image above is the point that the cycle track surface ties into the carriageway surface - no kerbs to fail and throw the rider. The dotted white line is simply there to help show drivers the edge of carriageway. There is also the 'mini-zebra' which keeps priority with pedestrians who cross to the 'floating' crossing point for the signalised crossing of the carriageway. The image above shows a set of the "elephants" feet which are designed to help show the route through a junction for people cycling. 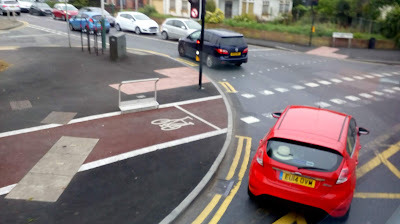 The markings are not parallel, which is a reflection of people being able to occupy the wider area before the stop line and then fall in tighter as they move through the junction and back onto the cycle track. As people move off at different speeds, they will naturally filter in. The image also shows one of the disadvantages in that the pedestrian crossings are off the main walking desire line and the arrangement also means there couldn't be diagonal pedestrian crossings if walking and cycling run together in the same traffic stage. Now, the layout can be tightened up for motor traffic because we don't design for the largest lorry which theoretically might turn into a side street and so with a bit more development, the pedestrian crossing points could be pushed closer to the walking desire line. I think the problem we have in the UK is the lack of national design guidance. I know there is some good local guidance out there, but even there, we don't get enough example layouts on how we can deal with common problems. In fact, the reason this layout has made it onto my blog has come from a request for help from a campaigner on how the left turns at parallel crossings could be dealt with and the layout developed from a bit of back and forth discussion. I also tweeted out a request for an example of the arrangement at Whitechapel High Street because I was convinced I had seen one. Obviously, I am interested in this stuff and so we now have a fairly accurate schematic and thought process (I hope) which solves the problem, but you are not going to find this in any design manual in this country. This is a problem because where we have designers working on projects who may not have the interest or knowledge in what is still a pioneering design subject in the UK (in a modern sense), we will struggle to think beyond what we are used to. Engineers are very good at copying (what works or doesn't work to be honest) and so that is why we still see some really poor designs because they are applying layouts in old (and often discredited) national guidance. The government always tells us that local authorities are best placed to develop their own guidance, but that is nonsense because most don't have the resources or knowledge. We still need a big book of layouts and case studies. 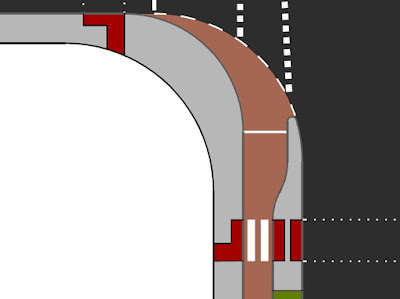 Anyway, have fun thinking about this one and feel free to criticise, because the layout is still on paper and it's easier to change than the kerbs! What about a flashing yellow on the LLCS rather than a red? That is what we decided would probably be the best option when considering the four proposed options for this junction today. That way cyclists can keep on going if it is clear without jumping a red but have to give priority to pedestrians if there are any crossing. That would be a very sensible option, but unfortunately, we are not allowed to do it. Flashing ambers are now banned on crossings which means that as pelicans are replaced, they will operate like conventional signals. Flashing ambers used in NL for right turning drivers who have to give way to people walking/ cycling straight on. Is that the kind of ban that you can ask DfT for an exception to or a blanket ban? 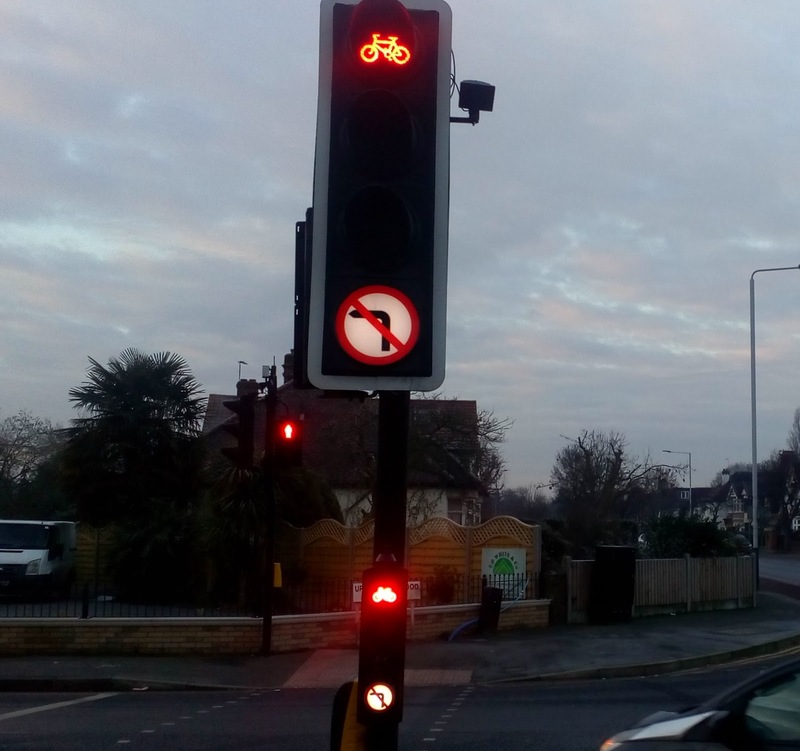 DfT has no interest in flashing ambers - they have been lobbied to use them off-peak as a give way rather than red signal, but there is no interest there. 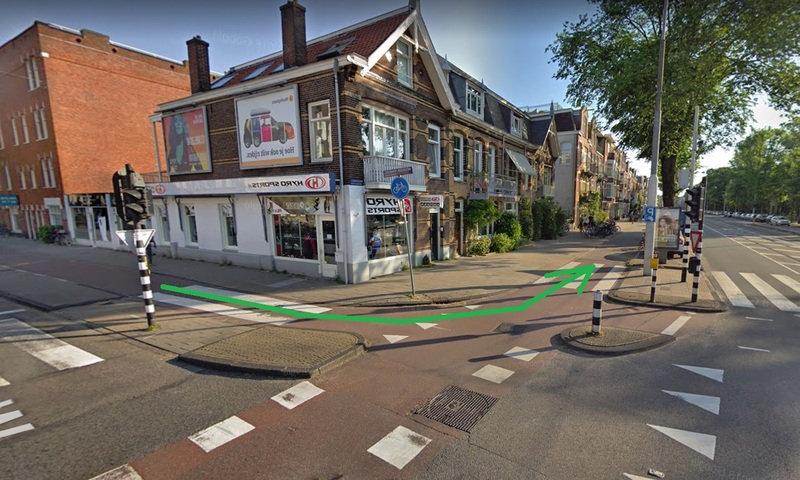 Including bicycle movements in the phase with all directions pedestrians crossing is an interesting way to help bicycles make the right turns, but how and where do bicycles wait when arriving in the default phase (main straight through)? You've probably seen examples of bicycle turning queue lanes, the dutch have them routinely. With a directional stop light in the main signals for bicycles (or the exception straight ahead against default red for all other movements) that would be another option rather than stopping around the corner on a low level signal. They can include a painted box showing where the bicycles need to wait, and a suitably sensitive loop detector there to trigger the phase for that side street. So a two-stage right turn as done in DK and in some UK locations? I am not any kind of engineer, so this is just a layperson's reaction. In the figure with the three sets of green arrow flows, I'm wondering about how they interact with cars. I'm assuming a separate green phase for the cars on the north-south main road, not pictured in the diagram, as you mention in yhe text. If those right-turning lanes are released at the same time the cars in them will stand in the middle of the junction waiting for the crossing to clear before they can finish their turn (which needs extra time), or they'd need their own phase. You can't combine the right-turn from the south with the green for the western side-street, like you could for bikes, even though they're heading in the same direction. Are the east-west side roads bicycle streets, with no or hardly any cars? In that case you could combine flows 2 and 3, as cyclists diagonally crossing each other's paths tends not to be a problem, from the all-green all-directions cycle scrambles I've seen in the Netherlands (though head-down British racing bike postures might make adjustments on the fly less easy). If there are a fair lot of cars coming from those side roads, and they get released by the same green lights as the bikes (as they are using the same lane), and head in all directions, that would make the chance of some of those cars turning across a cyclist's path during those second and third green phases quite dangerous. The flared left curve of the red cycle lane might invite car drivers to cut across it at speed around the corner, but it's an interesting idea. Worth trying out and monitoring, but probably very dependent on the actual curve radii whether cars will respect it (as well as clearly different coloured asphalt). I really like this design, which lets cycles and peds go together without any ugly fudges. But... can you use the LLCS on it's own at the side roads? The rules aren't clear, except to say that a LLCS is 'for the control of vehicular traffic consisting solely of pedal cycles'. But this can't mean what I think it means otherwise they couldn't be used for early starts etc. in general traffic?